Restful Services are getting more and more popular in our days and .NET developers prefer to build them through the Web API Framework, which let’s be honest it sounds right. You need to know though that WCF Framework also provides the support for building services that can be consumed over HTTP requests. This post will show you how easy is to create a WCF Restful service and consume it, either from a simple browser typing the right URL or from another application using an HttpClient. Open Visual Studio and create a new WCF Service Application named WcfRestfulService. At this very moment, VS has created for you a WCF service using the default binding. You can test it by right clicking the Service1.svc file and view it on browser. We are going to change that service in order to be able to invoke it using HTTP requests. First right click Service1.svc and rename it to HttpService.svc. Also make sure you right click it again and view it’s Markup (View Markup option). Make the respective changes there too. Delete the CompositeType from the HttpService.cs file changing it’s contents to the following. // NOTE: You can use the "Rename" command on the "Refactor" menu to change the class name "Service1" in code, svc and config file together. // NOTE: In order to launch WCF Test Client for testing this service, please select Service1.svc or Service1.svc.cs at the Solution Explorer and start debugging. 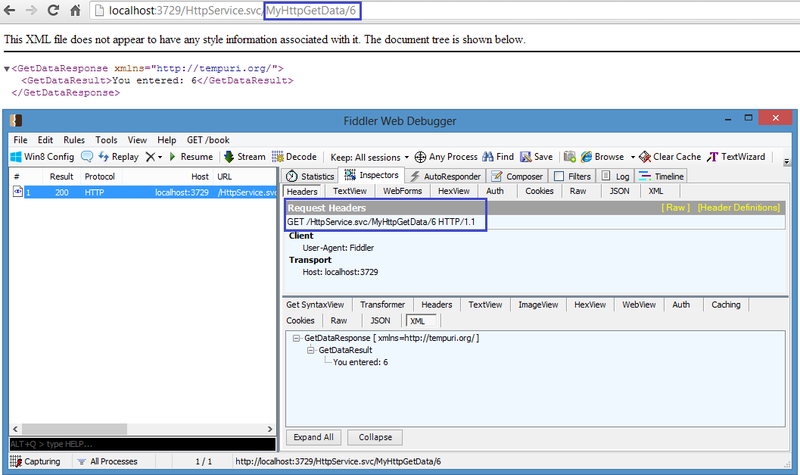 This HttpService class implements an IHttpService interface which has a simple OperationContract named GetData(int value). You guessed right, I have renamed IService1.cs file to IHttpService and made the following modifications. // NOTE: You can use the "Rename" command on the "Refactor" menu to change the interface name "IService1" in both code and config file together. When you want to make an HTTP call you use an HttpClient instance and it’s GetAsync method, passing the Restful Service’s URI. Build your solution, make sure both your projects are up and running (you may have to set them as StartUp projects) and click the button in the Default.aspx page. Click the following GIF image to watch it in action. There are so many and complicated operations that you can accomplish with WCF Restful Services and HttpClient applications you can’t even imagine.For example WCF Restful services can return appropriate HTTP Responses to client and clients can read from them specific property-value pairs and make respective actions. I hope we ‘ll have the chance to see them in action in later posts so stay in touch. Download the WcfRestfulServiceproject we have created from here. I hope you enjoyed the post. Very helpful post Chris!! I have been trying to save the xml output into the database. Can you point me on how I can achieve that? Saving a value in db can be done through an INSERT SQL statement. Use an nvarchar type column to save the xml. You will find plenty of examples out on the internet and in this post on how to save data into a database using C#. You can use classes such as SqlConnection, SqlCommand or the Entity Framework. ok, thanks. That’s what I am trying to do. I am guessing am doing this in the client side which is the default.aspx page right? This is what I have…I am a little confused…all I need a Table in my DB right? Do I need to specify the connection string on the HttpService.svc as well? Do I need to create a store procedure? Thanks. Hi Chris, following up on my previous question, I tried to read/load xml and display that when I run service.svc in the browser. I have included the XML that I am loading, service and Iservice. The problem I am having is with the Iservice. Would you be able to look at my code? Thank you for your help. Hi Chris, I was wondering how to save what have been displayed in the client side to the local drive? this line on Button1_Click? Thank you for your help.